Toad's Castle Why Doth The Koopa Sing? Why Doth The Koopa Sing? 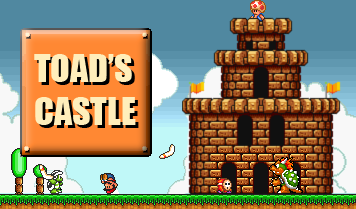 A searing bolt of lightning crackled through the sky and hit the tallest of towers on Koopa’s Keep. Then, as fast as the lightning, it retreated back up into the clouds it came from, frightened by a sound more hideous and terrifying then its own. Bowser had just finished watching a series of videos that gave singing lessons that he had bought after throwing the cooking lessons (see Gourmet de Koopa) in a fire, accidentally slinging in Kamek in with them. “Do Fa La So,” screeched Koopa. Kamek reeled in the corner, his eyes nothing but spirals. In the aftermath, Kamek looked out the window, seeing birds and squirrels, dead, littering the earthen floor. “You…you killed them,” muttered Kamek. Kamek shouted, “For fungi’s sake, NO!!! !” but it was far too late. Bowser peered over, “I will not disappoint my audience.” He started to sing into a microphone that was hooked up to several prodigious speakers. Kamek screamed, “No!” The force of the blast shot poor Kamek out of the castle, the stonewall not bothering to stop him. Prepared for such an occasion, Toad belted Mario with a hammer. The two citizens walked towards Mushroom Kingdom, while Mario secretly missed the peach. Toad missed his too. There Bowser stood, in front of the entire castle’s troops. “Now, ye underlings. Feast your ears on this.” Kamek thought he could have made it to the door, but he wasn’t sure enough. He, instead, jumped out of the window. Unfortunately, the blast of Bowser’s singing caught Kamek in the behind quarters and blew him through the two closest trees before carrying him some twenty meters away from the castle. Kamek brought up his finger. Bowser fought with Kamek, who was trying to take away his hidden synthesizer. In the struggle, they both fell into a huge pot of hot rock candy. The screams followed the pair all the way out of the castle.